You know I love LeSportSac and obvi all things Disney so as you could expect I just ADORE the new summer pattern! I wish I could afford to pick up a new crossbody for myself but I am even more excited to share this giveaway with you! 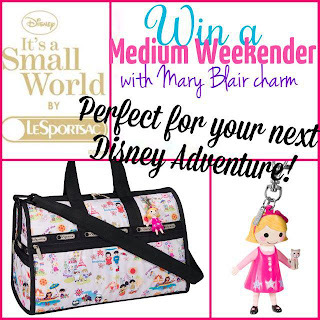 Thanks to some other fabulous blogger friends we have all chipped in to bring you this awesome giveaway for a Medium Weekender in the new summer Small World pattern! And if you can't tell from the charm closeup above this season's featured charm is Mary Blair herself! :) How adorable, right? Our giveaway begins on Sunday and will run through midnight Saturday night (May 5th-11th)! Bookmark this page and come back when the rafflecopter opens or keep your eye here on Picturing Disney for an updated post when the contest is live! Enjoy & remember a smile means friendship to everyone! This is a great sized bag. It would be terrific to win it. We have a lot of small trips and one huge trip coming up in a year or so. Tis bag would be perfect! Plus in a house full of boys, I need something girlie! Would love to win this!!! My favorite attraction! What a beautiful bag to offer as a prize!